Early in the New Year I wrote a blog post about ALLLL the things I was going to do this year. There were a lot. Creating an online pottery course and a podcast were just two. You can read it here. Three months later and guess what? I haven’t done any of them. Not because I didn’t have opportunity, or drive or resources- I had all of those things. So what stopped me? Instincts. Almost as soon as I started talking to you all about my grand plans via Instagram stories and my blog I had this tiny voice stemming from a deep part of me saying ‘Kara, are you sure you want to do this?’ ‘Is this the right path for you?’ What started as a whisper rapidly turned into a scream - ‘Kara, this isn’t what you want!’ I tried to power through, rationalising those voices as self-doubt or nerves - pushing them away, ‘pipe down in there!- I got this’ but something was definitely off. My great friend/ advisor/ mentor Megan (you might have heard me mention Megan - business coach/trusted advisor/wonderful friend everyone needs a Megan) talked at length to try and unearth why these voices were warning me off. We discussed why I wanted to create an online course in the first place, why I wanted to start a podcast- and what we discovered was none of the reasons I gave were good enough. None of them were loyal to my core reason of why I do what I do - that core reason is freedom. Whilst I love teaching others about pottery and I won’t stop offering lessons - I don’t want to be a teacher. I want to be a maker. I want to always be creating and getting muddy. 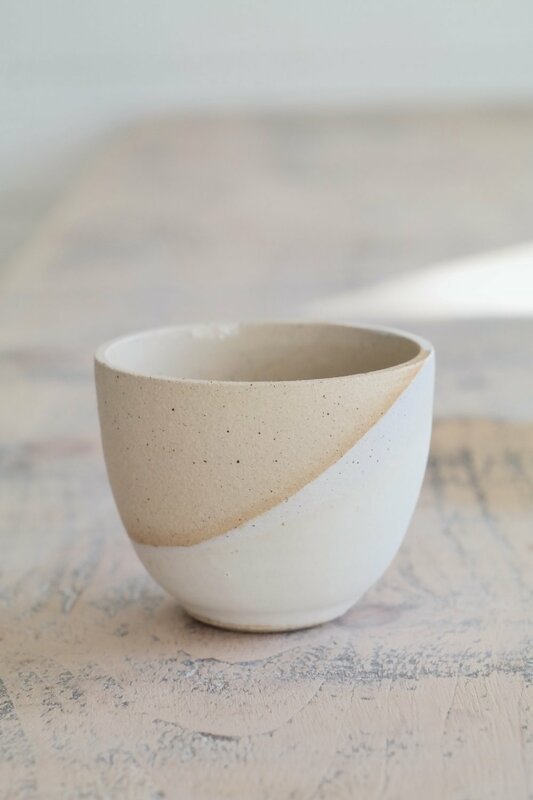 I love the practical problem solving which comes with creating a new shape or a new glaze. If I was to offer an online course I’d be pivoting my business to be more teacher than maker. That’s not right for me, right now. Maybe some day when my body is less able to withstand hours at the wheel it will be time for me to devote more of myself to teaching - but now is not that time. If I create an online course most of my time would then be spent administering it- I’d be teaching everyone else the things which I want to be doing myself. When I built my studio last year, I used teaching as a main justification for the spend but my new space has given me so much more than just space to teach; increased production, organisation and a calming space to work to mention just a few has proven its worth ten fold. I’m pretty sure none of you have been waiting around for me to launch an online course but if you have - I am sorry to disappoint you - it’s not going to happen, not yet anyway. I need to stay true to myself and my freedom and why I started my pottery business in the first place. Instincts have kept me and my little business safe so far, they have never been wrong. On the occasions when I have ignored the warning voice and gone ahead and done something anyway it has never turned out well. The podcast is not entirely off the table but it’s not a priority right now. As I said in my yearly round up blog post ‘Things might not turn out exactly as you planned but that’s ok. A plan is just a plan, its not set in stone, things are allowed to shift as your business evolves and as personal aspirations shift. If things turn out differently to what you thought it’s because the universe knows a better way. Trust that where you are is exactly right for you, right now.’ I need to take my own words on board. This isn’t me scaling back, not at all - this is me redirecting energy to the right places. Focusing on pushing myself as a maker. Giving myself the time to travel- I get so inspired by travelling. Making time to see more art; live music, exhibitions, reaching out to fellow creatives - these are the areas which will nourish my business and my soul. Maybe I will see a compatriot start up an online pottery course over the next few months and become another IG millionaire. Well, good luck to them - they have my blessings. I will be in my studio playing with mud.